The area at the base of the lighthouse is a tribute to the work of the Lighthouse Keepers and their families. 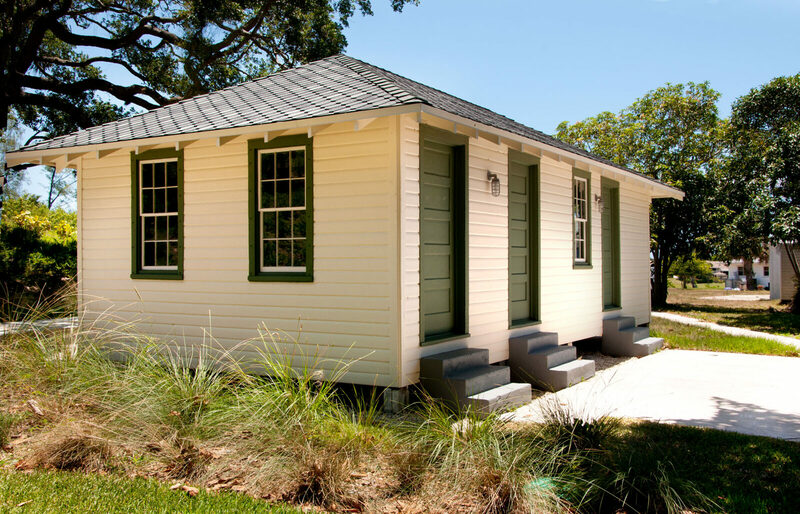 Although their houses and some of the buildings associated with the Light Station no longer exist, we are dedicated to preserving and interpreting the lives of those who worked diligently to keep ships safe under challenging circumstances at the edge of the Florida wilderness. The educational exhibit Keeping the Light at Jupiter Inlet is open for visitation and located in the Modica Family and The Joe Namath Foundation supported Keeper’s Workshop. Today the building houses the exhibit Keeping the Light at Jupiter Inlet. Multi-dimensional displays tell of the arduous lives of the Lighthouse Keepers in Jupiter’s early days. It features a interactive timeline, artifacts and photos and video table narrated by a young Charlie Pierce. The exhibit is open during normal business hours for grounds visitors and school groups. Built in 1929 to replace an earlier pump house/paint storage building damaged by the devastating 1928 hurricane, the workshop was originally divided into three rooms, each accessed by one of the three doors on the south side of the structure. The westernmost room was the well room. You can see the top of the cylindrical 1850s masonry “bucket drawn” well, the jack pump foundation of the 1920s, and the cast iron “stand pipe” that was placed in the center of the well to draw water in the 1920s. The building also housed the paint supplies for the lighthouse and a workbench for the keepers. The first Lighthouse Keeper’s House, built in 1860, was only 26′ x 30′. It had two-foot-thick coquina walls and a cistern beneath so that the occupants could withstand possible Indian attacks. None ever occurred, for by the time the Lighthouse opened the Seminoles were friendly and frequent visitors. It’s hard to imagine that the head keeper and two assistant keepers all lived in this single house with their respective families and shared an outdoor kitchen. Everyone could finally have private home space in 1883, when a new two-story dwelling with a porch on three sides was erected for the head keeper. The original dwelling was finally expanded to accommodate the family of one assistant keeper on the first floor and the family of the second keeper on the floor above. Sadly, in 1927, this assistant keepers’ house was destroyed by fire. 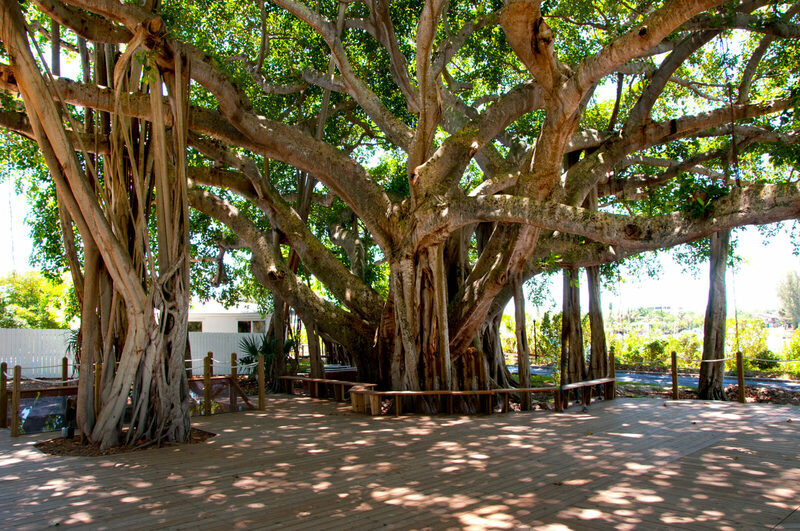 The Ficus altissima tree, was planted in 1935 in tribute to the Keepers who had lived there. The beautiful deck surrounding this amazing tree interprets the original location of the house and veranda, including the 3500 gallon cistern that housed their water supply. Look for the angled patterns to find the outline of the house and veranda. The deck area is a very popular spot for historic destination weddings! Expect to see preparations for weddings on Saturday afternoons. And please do not climb the tree!